After a long, dreamy summer filled with boogie boarding, hiking, biking, and all around fun in the sun, it’s back to the post-Labor Day reality check. So let’s get real–you need some rejuvenating TLC for mind, body, and of course, your skin. The good news is The Pearl is at the epicenter of some of the best Korean spas in the US. So get ready to be rubbed, scrubbed, steamed and soaked! Korean spas generally offer all the same treatments as their western counterparts, but the entry fee is often lower and many facilities are open 24 hours a day. How do you Jimjilbang? Say what? Korean spas have separate men’s and women’s facilities, but the heart of the spa is the Jimjilbang, a common co-ed area where families and friends can gather to get pampered together. A word to the body-wary, the gender segregated saunas and tubs are strictly clothing not optional. A mainstay of the KTown spa scene for decades, Beverly Hot Springs is the only natural hot springs in Los Angeles. According to a chemical analysis made in 1931, the alkaline water, which flows from a natural artesian well 2,200 feet below the Earth’s surface, contains an apothecary’s treasure trove of therapeutic minerals including silica, magnesium, sodium carbonate, and sodium chloride. Split on two levels separating men’s and women’s facilities, this urban oasis lures you into a zen vibe complete with Buddhist motifs, soothing man-made rock waterfall, lush orchid ornamentation, and a huge satori-inducing soaking pool. So many rooms, how do you choose? Crystal Spa presents a wonderland of traditional spa experiences to aid your journey into wellbeing. 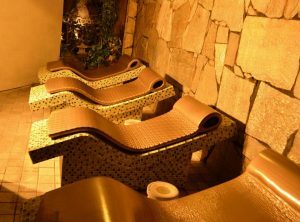 Kick back in the Mud Room or Yellow Sand Room, where you can revitalize with 100% Korean mud from the famous Chungchoong Jincheon region. 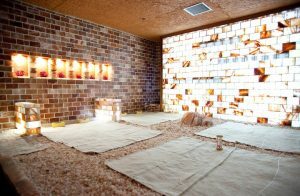 Or banish stress in the Salt Room, made with all-natural mineral ore from the Himalayas. Enter the refreshing Ice Room after a steamy soak or try the Charcoal Room, where negative ions released from the charcoal purify the air and consume harmful agents in the environment. An Aveda Lifestyle Spa, Crysta Spa also offers complete skincare/body care/make-up/manicure/pedicure service for female clients. 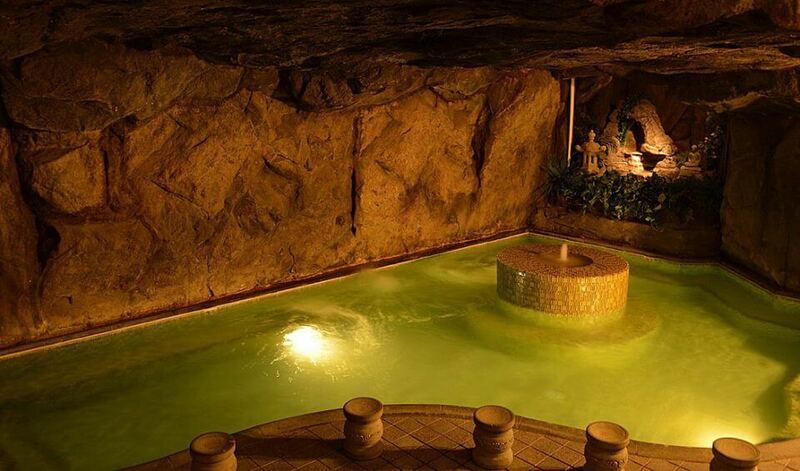 Come for a soak–ancient Korean style, and stay for a treatment. 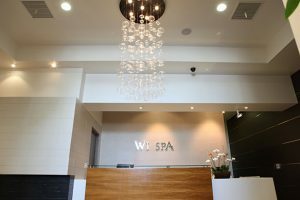 Wi Spa’s extensive spa services include buff and seaweed massage, acupressure, body scrub, facials, and mani/pedis. Distinctively designed men’s and women’s floors offer hot and cold tubs, dry and steam saunas, treatment stations, showers, and beauty and grooming areas. Explore the five Signature Sauna Rooms: Bulgama (thermotherapy), Salt Sauna, Clay Sauna, Jade Room (made of jade with sodium and minerals in the walls), and Ice Sauna, your final stop after a day at the spa. Bring your friends and family to the jimjilbang on the co-ed floor, or visit the restaurant, fitness center, and rooftop terrace. There’s even a kids fun zone!